Ever since I saw bits of H&M beauty popping up on social media, I knew I had to try them out. Over the last couple of weeks, I’ve spent a fair amount of time and money, trying the products out and wanted to share thoughts with you. The H&M beauty range is quite extensive. 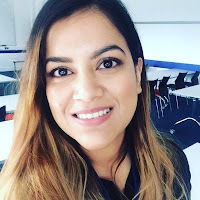 It features everything from complexion, cheek products, lip products, a very wide range of colours in eye shadows and nail polishes, not to mention a few eye shadow palettes too! I also spotted some skincare in the form of face masks, but I haven’t tried any of them as of yet. Getting back to what I actually bought. As soon as I saw the blusher packaging, I knew I wanted one. It took me quite a while to decide on a shade, as there such great choices. I went for H&M Powder Blush in Golden Peach (£6.99) which I swear is a dupe for theBalm Hot Mama blush! The packaging is plastic, so light yet doesn’t look cheap. 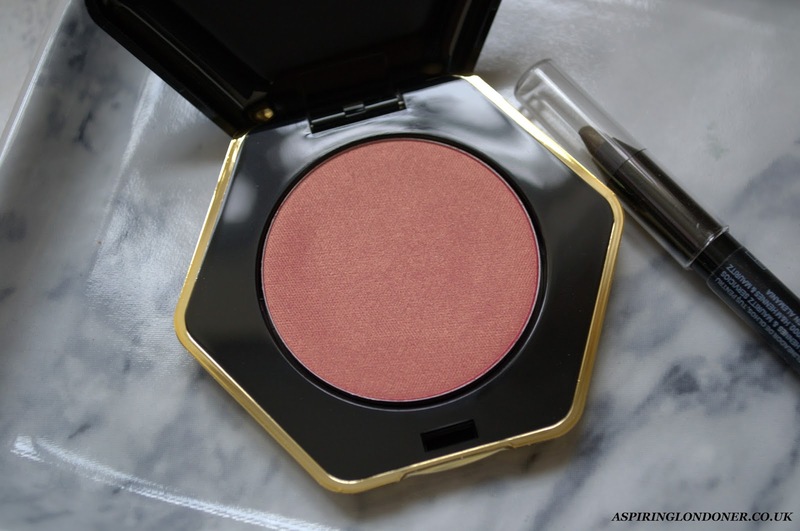 I love the hexagonal black pan with a gold base, pretty awesome for high street makeup packaging. The blush has high colour pigmentation and the shade Golden Peach is just that, a peach blush with golden shimmer running through it. It’s so pretty! I will definitely be picking up more shades from the powder blush range, there are 10 shades to choose from. They have cream blushes too in cream/gold packaging. 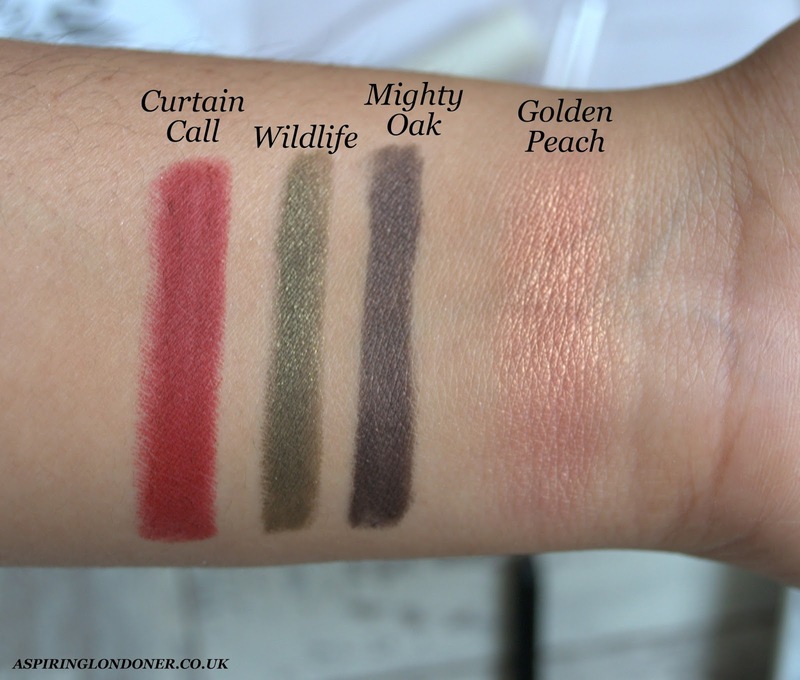 They swatched beautifully in store, but I hardly reach for cream blushes in A/W so I’ll wait till S/S to pick them up. There were a lot of lip products to choose from – lip pencils, cream lipsticks, lip liners, lip stain, lip glosses and lip creams! I swatched all the formulas and picked up H&M Beauty Lip Colour-To-Go Pencil in Curtain Call (£4.99). 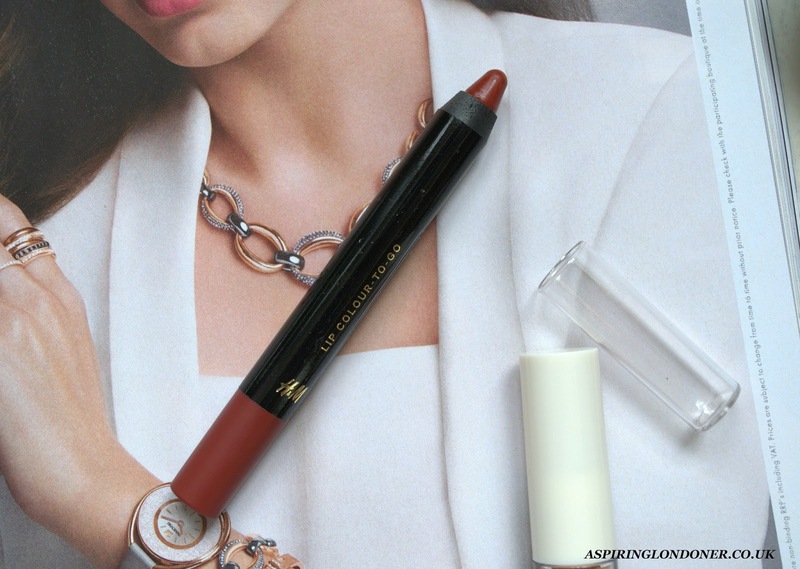 The formula of the lipstick pencil is creamy yet has a matte finish. These are perfect dupes for the NARS Velvet Lip Pencils. They might even be better as they are not as drying as the NARS lip pencils. The shade Curtain Call is a rusty red kind of shade, really perfect for the A/W season. 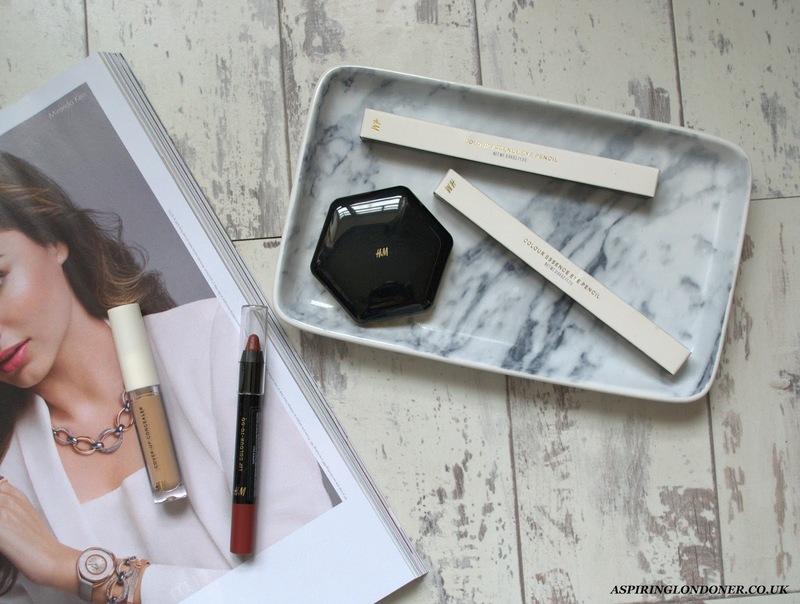 Under £5, these lip pencils are an absolute steal! Some of the lip pencils come in a glossy finish too. From the other lip products I swatched, the H&M Beauty Velvet Lip Creams (£6.99) caught my eye too. I didn’t pick any up as I have far too many lipsticks right now. However just from swatches, these seem like great dupes for the Sephora Lip Creams, again might even have better lasting power as the swatches took some effort to come off my hands! 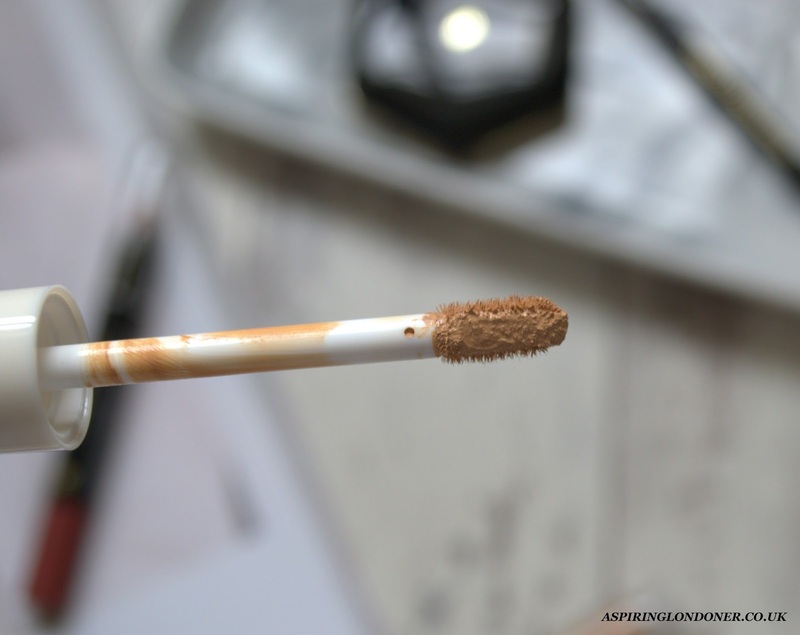 The product that blew me away the most was the H&M Beauty Colour Essence Eye Pencil (£3.99). I wasn’t going to buy any as I have so many already. But as soon as I swatched and the pencil literally melted on the back of my hands, I knew they were coming home with me! Buttery soft formula, and such vibrant colour pay off and all under £4 from the high street! 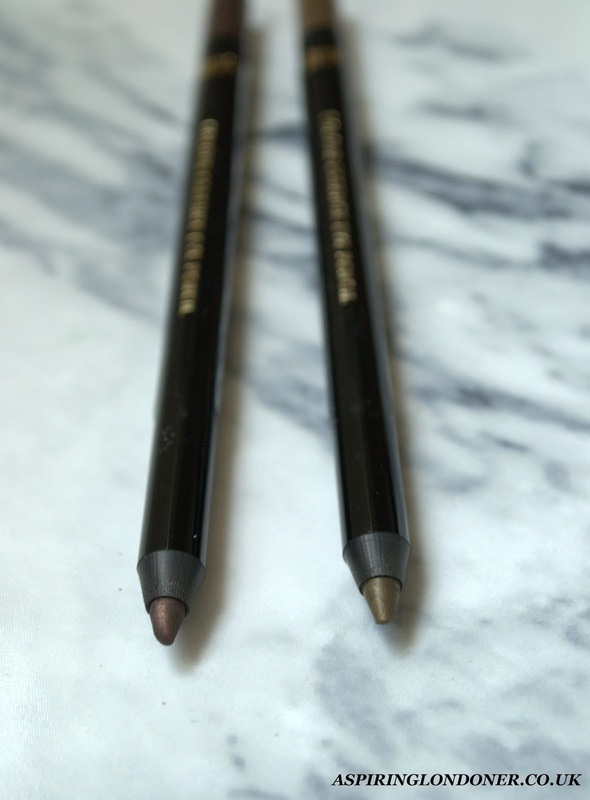 These are easily the closest I’ve gotten to the popular Urban Decay eye pencils! Honestly it took all my will power not to buy every single one! I bought the shades Mighty Oak and Wildlife. Mighty Oak is a dark brown with the tiniest bit of shimmer running though it, and Wildlife is an olive green shimmery pencil. Next on my list are Over the Taupe, Raw Umber and probably the rest of them as I loved them all! I’ve worn them as liners, smudged them along my lash line for a smoky liner look and even worn them as all over eye shadow. They’re really long lasting as eye liners, but if I use them as shadows, they do crease as I have super oily lids – with a prime though, works great. I cannot recommend these eye pencils enough! I swatched the H&M Beauty Eyeshadows too; the single shadows have much better formula than the palettes. The single eye shadows are buttery soft and really pigmented, whereas the palette eye shadows aren't as soft nor as pigmented. I will be picking up some single shadows, there were SO many shades, I just couldn't decide! Last but not least, the H&M Beauty Cover-Up Concealer (£4.99). I was uhming and ahhing over whether to get this or not. As I wasn’t certain about the colour match and I generally have little faith in high street concealers. Seeing as it’s under £5, I decided to give it a go. 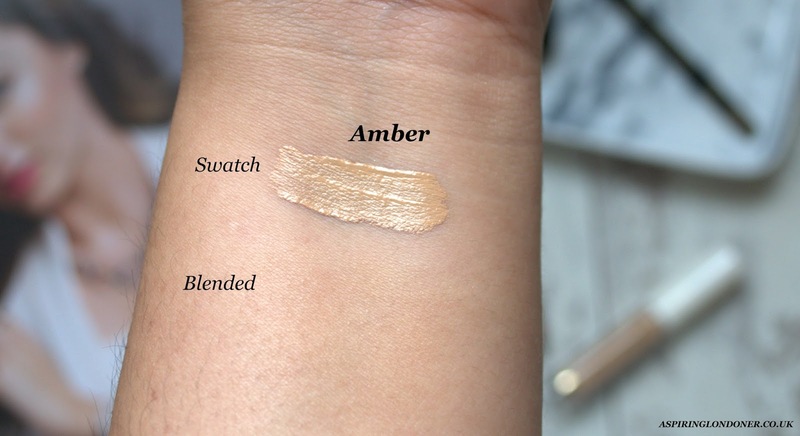 I picked up the shade Amber as it looked like a decent shade match. It’s the tiniest bit warmer than my normal shade, but probably as good as it’s ever gotten with high street concealers. Once blended it’s virtually undetectable. I was really surprised at how creamy yet light the texture is! It’s so reminiscent of the Urban Decay Naked Weightless Concealer, which is triple the price. It gives medium coverage, so suitable for general acne scars and under eyes. It didn’t crease under my eyes and blends really seamlessly. I’m a fan of this too! It feels so refreshing to come across a high street range that has such brilliant quality. Everything I bought, I’ve absolutely loved and will definitely repurchase! Every single product I bought reminded me of a higher end product I’ve tried, which is a testament to how phenomenal the quality is. H&M Beauty products have completely won me over! What will you be picking up from H&M Beauty? 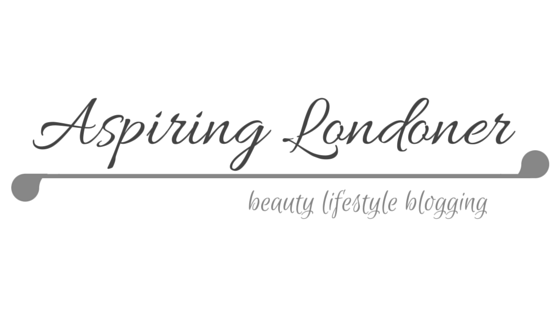 Share your recommendations in the comments below or tweet me @aspiring_london!